Sabbaths are like periods inserted into an otherwise endless run-on sentence. They help us know when it is time to stop and take a breath. They remind us to take a weekly break from living in commodity time to re-anchor ourselves in what we might call “organic time,” a way of living more in tune with our own deepest needs — as well as those of our family and the entire community and society of which we are a part. Wishing everyone a sweet Shabbat! Join us tomorrow morning for services led by Rabbi Howard Cohen. Over the next few Fridays, our meditation minyan schedule will be in a bit of disarray. Tthere will be no meditation minyan this week (July 27) or next (August 2). We’ll return and meditate once again on August 9; then we’ll miss one more week on August 16. After that we’ll be back to normal and meditating every Friday again. So, to recap: there will be no meditation on Juy 27, August 2, or August 16. Otherwise we’ll continue meeting every Friday throughout the summer and, as far as I know, well into the fall. Thanks for bearing with me during the busy summer season. The Shabbat which begins tonight is called Shabbat Nachamu, “Shabbat of Comfort.” After the deep dive into sorrow which was Tisha b’Av, this week we begin the “seven weeks of consolation,” cultivating hope and comfort as we ascend towards Rosh Hashanah. And what better way to cultivate your sense of hope, comfort, and connection with God and with community than to join us for Shabbat services tomorrow? This Shabbat I’ll be joined on the bimah by ALEPH rabbinic student David Curiel, who will be our High Holiday cantorial soloist once again this year. Join us for davenen at 9:30 and enjoy harmonies, short teachings, and plenty of joy. 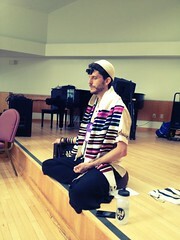 Photo: David leads a meditative service at the 2013 ALEPH Kallah. There are seven weeks between Tisha b’Av and Rosh Hashanah. The Days of Awe are coming soon! During these seven weeks we have the opportunity to enter into a process of teshuvah, examining who we are and who we’ve been, where we’ve lived up to our hopes and where we could do better in the year to come. Join us for a sweet Shabbat of song and comfort as we enter into this journey together. The book of Dvarim, also known as Deuteronomy, begins on the far side of the Jordan River. Most of us don’t speak Greek, so the Greek name Deuteronomy doesn’t mean anything to us beyond being the name of this book of the Torah. But it comes from the Greek Deuteronomion, which means “second law.” This book of Torah is called Deuteronomy because it is largely a retelling. The Hebrew name Dvarim can mean either “words” or “things.” The opening line of the book reads, “These are the words (or things) which Moshe said to all Israel on the other side of the Jordan.” Over the course of this book, Moshe will remind the Israelites of the journey they’ve undergone. In this week’s portion, which is also called D’varim, Moshe reminds them of a few choice incidents. Notably, the moment when he realized he couldn’t do everything himself, so he appointed magistrates and judges to share the burden of leadership — and the the time when they sent twelve scouts into the promised land, and ten of the scouts lost faith in God, which doomed the whole generation to wander in the wilderness. And then Moshe reminds them of some of the battles they’ve experienced. Both the hard stories, times when God warned them that She was angry and wasn’t going into battle with them — but the people failed to listen, and went into battle anyway, and lost grievously… and the proud stories, times when they defeated powerful rival kings and nations, because they had God on their side. Leaving aside for the moment how we respond to the theology which said that God went with us when we won, and God was angry at us when we lost — what is going on in this parsha? Place yourself in the sandals of the children of Israel. They’ve just spent forty years in the wilderness. They’ve encamped on the banks of the river which is the final boundary between them and the nation they intend to conquer. Why are they listening to the retelling of a story they just lived? From a historico-critical point of view, one could make the case that this is a visible seam between two different stories, written down at different times. For those who are serious Sherlock Holmes fans, this is called the Doylist perspective: looking at the story with awareness of the circumstances of its authorship. But from a Watsonian point of view — looking at the story from the perspective of someone who is inside the story — there’s a different way to make sense of this retelling. Moshe is retelling the story they’ve all just lived through because it’s a way to sanctify their memories and seal those memories into their hearts. I’m writing to correct the dates of Tisha b’Av; the announcements which went out this week contained a date error, for which I most sincerely apologize! The days of the week were correct (Monday night, Tuesday afternoon) and the Hebrew dates were correct, but the Gregorian calendar dates were off by one day. We will indeed be meeting for our evening service at 8pm on Monday — which is July 15th, not the 14th as was in the original announcements. And we will gather for afternoon study at 3pm on Tuesday — which is July 16th, not the 15th as was in the original announcements. All are welcome to attend one or both of these observances, regardless of whether or not you are fasting. On Monday night we will read the book of Lamentations in English, hear a little bit of it in the mournful melody unique to this day of the year, and immerse in some poetry designed to open us to the loss and grief of the day. On Tuesday afternoon we will study texts about repentance and fasting as the day takes a turn from despair toward hope. We’re delighted to be able to announce that we have made two wonderful hires for the coming educational year at CBI. Chris Kelly-Whitney will be returning to our education team as Education Administrator; you’ll be hearing from her soon with registration information for the new school year. And Jane Shiyah, who recently retired from many years at Lanesboro Elementary School, will be returning to our education team as the lead teacher for our Aleph-Tav (first through fourth grade) program. We deeply appreciate all of the talented applicants who applied for these positions, and we’re looking forward to an exciting new year of learning and teaching here at CBI. Chodesh tov: a blessed new month to you! Today we enter into the lunar month of Av. During Av, we experience the low point of the Jewish liturgical year — and some sweet high points, too. For members of our Rosh Chodesh group, there is a nondairy potluck lunch at CBI today at noon (bring a salad of some kind to share) — we’ll ring in the new month with a lunch-and-learn focusing on some of the unique spiritual gifts of the month of Av. This year at CBI we’ll observe Tisha b’Av both with an 8pm service on the night of July 14 (featuring Lamentations, poetry, and a guided meditation) and a 3pm study session in the afternoon on July 15 (featuring texts relating to Tisha b’Av, to communal cohesion, and to the spiritual impact of fasting.) We’re inviting the folks at Beth El in Bennington to join us for both of these as well. This year, our month of Av overlaps with the Muslim holy month of Ramadan. (The Muslim sacred calendar, like ours, is lunar; but we have a system of “leap months” in seven out of every nineteen years, to keep our fall festivals in the fall and our spring festivals in the spring. They don’t have that system, so their holidays move around the secular calendar. This year, the month of Ramadan overlaps with our month of Av.) We’ll learn a bit more about that, and about how our two traditions understanding fasting, at our Tisha b’Av study session. One week after Tisha b’Av comes Tu b’Av, the 15th of Av, which was once a great festival of romance and dancing — a kind of corrective to the solemnity of Tisha b’Av. Stay tuned for more on that. Wishing all of y’all a meaningful passage through this month!